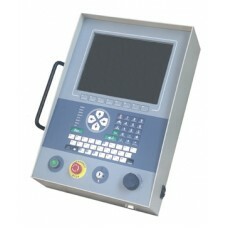 The Professional Machine Controller (PMC) is available with a 10.4" colour TFT display and a QWERTY keypad. The PMC controller can operate upto 4 stepper axis or 4 servo axis or a combination of each up to a total of 4 axis. With the ability to also produce signals for open loop motors, the number of actual axis can be increased and therefore it is capable of automating most machines. The PMC is our most recently developed motion control system that is completely flexible and programmable to automate multiaxis machines. It can be used not only in motion control applications, but also in temperature control applications making it an affordable and simple solution as there is no need for an additional HMI or additional PLC. The PMC controller runs our proprietary operating system called Blackthorn. This gives us a very stable and fast embedded platform to run user programs on. User programs can take many forms and some customers prefer to have their own program written to suit their machine. This would be done in 'C' code or similar and compiled to run on our system, don't worry, if you choose this route we have technical support available. This cable is designed to connect TRM's controllers to electrical cabinets using 44 way D Male conne.. This cable is designed to connect TRM's controllers to electrical cabinets using 37 way D Female con.. This drive is rated at 24-100 volts DC, 20 amp, 2Kw max* TRM has designed a range of high quality.. This drive is rated at 24-100 volts DC, 10 amp, 1Kw max* TRM has designed a range of high quality.. This drive is rated at 24-100 volts DC, 5 amp, 500w max* TRM has designed a range of high quality..
A handheld 100ppr Encoder for CNC manual control applications with selectable scaling and axis. .. The 4 axis Interface board is designed to allow the machine builder to route cables in the most ec..